Learn how to color using Copic Markers. Do you need guidance on where to shade? Confused on what colors to use and when to use them? Well, I'm so glad you have stumbled upon this page. You are in for a treat, my friend. Maybe you're a stay at home mom with little ones and just want some time for yourself to create, but not just to sit and color but learn how to color and create your own style of art using Copic Markers. Maybe you want to start getting noticed by companies and you want to stand out enough where they recognize you and want you to be on their Company Design Team. Perhaps, you want to practice coloring stamped images so you can start submitting your work to crafting magazines. Or maybe you just want to learn how to use those $8 a piece markers that you had to have! I remember picking up my first Copic Marker and thinking, ok, where should I put my shadows? What colors do I use and what do I use first? Am I using the right paper? After so many trial and errors and teaching so many students my techniques and how to color using Copic Markers I can honestly say my students' first projects come out WAY better than my first attempts at using Copic Markers. I wanted to create an Online Copic Marker Class where you can learn a variety of techniques using mostly the same Copic Marker colors and include ALL of the images you will need to color! 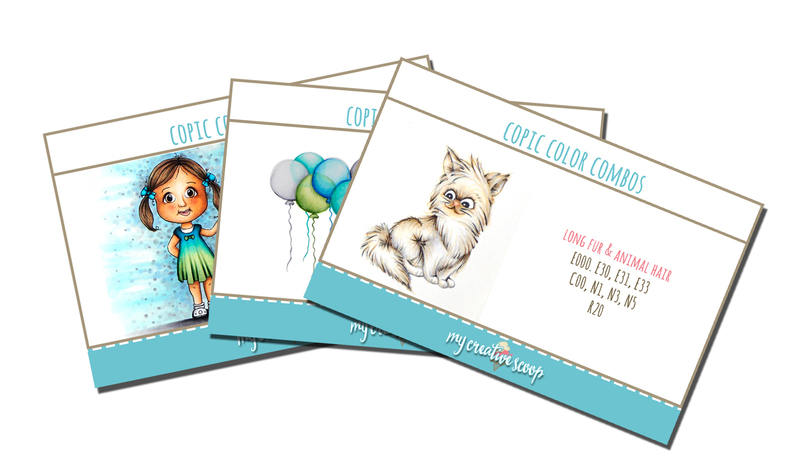 You will not only learn a lot of techniques but you'll receive 4x6 color combo cards for each technique you learn. You'll get my Technique Bubble print out so you can practice techniques and blending in the bubbles. You'll also get my technique worksheets for practicing coloring hair and skin colors! Hours of videos and instructions using a variety of different images. You'll learn many different techniques. You will learn how to incorporate the same colors in different scenes perfect for those who are just starting their Copic Collection. If you are already a member of My Digital Library you already have access to some of the images we are using but there are a few Exclusive Images only offered to those who take this course! If you have ever taken a Copic Class you will notice that most classes focus on one particular area, Hair, Skin, Animals, Backgrounds etc. Well, in this Online Copic Class you will get so many of these areas all in one Class! Everything you need is in this course all you need are the Copic Markers. I'm SO excited to help you discover all of you Copic abilities.